This is it: the season finale, featuring the Avengers versus a vastly empowered Loki with the fate of the Nine Worlds hanging in the balance! So I’m going to go ahead and say that if you can’t appreciate how awesome the opening scene of Tony Stark working at the dwarf forge to re-make his armor is because, well, it’s totally realistic, then you just don’t get superheroes. Because it’s pretty awesome. 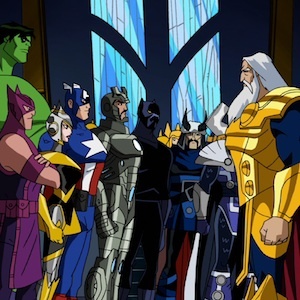 Indeed, there’s a nice lead-in of the Avengers converging on Asgard to bring the fight to Loki as the episode opens. Note how the Hulk and the Warriors Three go from taking down frost giants to on the ropes facing a group of “ordinary” Asgardian soldiers and various trolls, ogres, etc. Fortunes can shift fast in superhero stories, and it’s the set-up for Sif, Wasp, and Giant-Man to swoop to the rescue. Nice homage with the Hulk rescuing Brunhilde, his comic book teammate in the Defenders. Dare we hope for an Avengers vs. Defenders story in the future? Black Panther’s “Perhaps we should win this fight before starting another” is classic Marvel, trying to put aside the team bickering. The arrival of Hawkeye and Black Panther quickly turns the tide. Loki’s minions start toppling like ten-pins: Wasp alone takes down a half dozen! There feels like a definite “tipping point” in the conflict, either a shift in the context of the scene or simply the Avengers building up enough numbers or resources to wrap things up. Note: Panther refers to Loki as Thor’s “half-brother,” a minor continuity error, since he is technically Thor’s “step-brother” or “adoptive brother” (in the comics, Thor and Loki are not related by blood, Loki is the son of slain Frost Giant king Laufey). Captain America’s scene with Hela (who isn’t named) is some classic “let me tempt you” superhero roleplaying and should earn Cap’s player some points for the later scene, particularly given the bargain he must strike for Hela to send him to Asgard. In an RPG context, one can’t help but wonder if this scene would be planned (the GM having Hela’s offer in mind in advance) or spontaneous, with Cap’s player pitching the idea of the bargain in order to deal with the challenge of Hela and escaping Nifelheim? Okay, I really thought Hoarfen would be Fenris, but it’s interesting to note Hulk’s “feels bigger” comment: in some RPG contexts, that would be an actual game mechanic, a player making a declaration of some sort that influences the course of the game. Perhaps it was more giants, but one of the players decided to “up the stakes”? It certainly could be a reflecting of a narrative-control mechanic or simply players “shilling” for bonus points by choosing to complicate matters themselves. Captain America’s rallying cry is without a doubt a key element of his character; he’s a true inspiration. It’s not that Cap’s tactics are that brilliant, it’s that he helps the team overcome setbacks and motivates them. Any superhero game system needs to be able to model this in some way, or characters like Cap lose an element of who they are. Note how Cap immediately turns the tide against Hoarfen: from the moment he shows up, the giant wolf doesn’t score a hit against the heroes and they take it down fairly quickly. Another turning point. The Avengers’ initial assault on Loki is a near-perfect example of attack/counterattack: The Avengers go first and Loki counters each of the Avengers’ attacks, with some of his counter-moves actually knocking them around: he hurls Sif into Faraday, flips Black Panther into Giant-Man, and then—on what amounts to his “first action”—takes everyone down with a sweep of his trident. There really are few ways of emphasizing omnipotence better than having a villain destroy Captain America’s “indestructible” shield. Cap and the team definitely rack up some setbacks during Loki’s gloating monologue. Iron Man gets a nice entrance, perfectly set-up by Loki’s “who will save you now?” line; either a terrific GM hand-off to a player willing to narrate that moment, or a Gamemaster doing to description, then handing it over to Iron Man’s player to stand up to Loki. Again, notice how Cap takes command and rallies the troops. “When in doubt, blow it up.” Hawkeye’s motto could be that of many a gamer, as well. What if Black Panther hadn’t stopped Hawkeye? That’s a possibility every GM has to consider. Maybe trying to blow up the Tree of Life wouldn’t have done anything, or maybe it would have led to a very different ending to this story! Note the key to defeating Loki isn’t “hit him until he runs out of hit points” (fails a Toughness check, etc.) it’s “find a way to break his hold on the Odin-Force”. Although the Avengers fighting Loki manage to get some hits in and even send him flying, there’s no evidence they’re actually “damaging” him in any way other than (as Iron Man says) keeping him occupied. No-Prize Time: Another minor continuity error: Cap appears on the bridge to confront Loki carrying his (undamaged) shield, which is broken again in the epilogue of the episode (meaning it wasn’t miraculously repaired as a result of Loki’s defeat). In the end, the Avengers get their props for saving the cosmos, Loki goes to his rightful (and suitably mythic) punishment, and we get the foreshadowing of Season 2’s major plot-line. Just Shut Up and Be Awesome: It takes a certain suspension of disbelief to handle the superhero genre, with all of its “mad and beautiful” ideas and tendency to toss real-world things like physics and social dynamics out the window whenever they become inconvenient. Might sound like strange advice coming from the guy who spends time analyzing cartoons from an RPG perspective but, don’t over-think things when it comes to superheroes being awesome. In particular, when it comes to your hero, don’t let realistic expectations get in the way of being awesome: just go for it. Be heroic, iconic, and plain over-the-top super. Be Willing to Wait for Help: Counterpoint to the “just be awesome” observation don’t let your “invincibility” go to your head. In order for the story to have drama, there have to be setbacks and challenges, and there are going to be times when your hero suffers defeat or needs help. Part of the dynamics of a team superhero story is letting different characters take the lead and save the day. A good GM helps to manage this somewhat, but good players also don’t hog the spotlight and even look for opportunities for their teammate to shine and help them to get there. It’s even possible for turn-order and the like in an RPG to encourage this kind of thing. Be Open to Opportunities: One of the best things about a live RPG is you don’t really know what’s going to happen. It’s being creative on-your-feet and in the moment for both the GM and the players and, when all cylinders are firing and inspiration strikes, it can be pretty amazing. Be open to those moments and don’t get overly attached to the way things “should” go. By all means stay within the spirit of the game and the genre, but a good game will provide players with opportunities to get creative, even some situations that require it. “Leaders Lead”: Leadership and teamwork are big elements of the superhero genre; charismatic leaders barking “Maneuver 7!” or “Fastball Special!” and hero teams overcoming more powerful foes by becoming greater than the sum of the individual members should be encouraged and rewarded in the context of the system. There’s definitely a roleplaying element here, and players inclined to play leader-types should do so, and players should look for opportunities to work as a team, but it’s helpful if the system rewards such behavior in order to encourage it. “Invincible” is Relative: In the comic book genre in particular, anything is possible: supposedly “unbreakable” metals get broken, foolproof countermeasures are overcome, etc. The trick is to ensure this doesn’t happen so often that those categories become meaningless. It’s no fun having an impervious shield if every bad-guy gets to show how macho he is by breaking it, nor is it fun to be the greatest whatever in the world and have every guest star show you up by having equal or greater skill. While “absolutes” in the genre rarely ever are, exceptions should be for emphasis, to underline their rarity, rather than to render them pointless. Tipping Points: This episode in particular seems to demonstrate a three-level breakdown in superhero conflicts: lesser, equal, and greater. Lesser: These fights are almost pro-forma, in that the foes don’t stand much of a chance; the heroes take them down pretty easily, even if they still have to “go through the motions” of doing so. This is the classic “minion” fight, where heroes often have a significant (statistical or story-based) advantage. Equal: At this level there’s some real back-and-forth, with both sides taking some hits and a relatively equal chance of either side coming out on top. This is what most game systems seem to strive for in terms of conflict mechanics with “game balance”. Greater: This is almost the reversal of the Lesser level, in that the heroes’ foe is essentially unbeatable by normal means. Their regular attacks have little, if any, effect and victory may only be possible through some type of lateral win, defined as something other than standard combat.